The Mass Rapid Transit is the metro system that gives transportation to the capital city of Singapore. It currently has five lines, which offer transportation to 106 stations distributed around the city via its 178.2 km long railway. The trips in the MRT can be paid in many ways, including standard tickets, cards, and subscriptions. All of the metro’s lines are open to the public from 5:50 am until 1:00 am. It is possible to reach the airport by using the metro. Singapore is a young country. It achieved independency from the United Kingdom in 1963, when Singapore was one of the poorest nations in the world. However, after a strong industrial development between the decades of 1960 and 1990, it reached levels of economic growth similar to those of rich countries. It was known as one of the four Asian Tigers due to its rapid industrialization, alongside Hong Kong, Taiwan, and South Korea. Nowadays, Singapore has the busiest harbors in the world in terms of commerce. It also has a strong influence on the region. The country’s population is barely over five million people. However, it receives approximately 10 million tourists each year. The Singaporean government did a survey during the 70s, and noticed the rapid increase in the number of tourists for such a small territory. Therefore, the Singaporean government took the decision of building a system of mass transportation. In 1983, the firm called SMRT Corporation began the construction of the Singapore Metro, which was renamed as MRT (Mass Rapid Transit). The system was built in stages, beginning with the North South Line. In November 7th, 1987, the first line was inaugurated with only five stations, which had a six km long railway. Although the stations and trains were operational at this time, the official inauguration of this line was actually in March of 1988, with the opening of 15 stations. 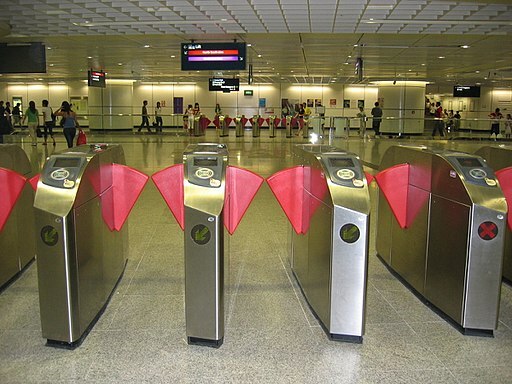 Two years later, SMRT Corporation inaugurated 21 additional stations. Afterwards, the MRT got a significant expansion. It currently has 106 stations and a railway of 178 km in length. Additionally, there are 13 stations under construction, and there are plans of building an additional 35 stations. Without a doubt, the Singapore Metro is a clear sign of the economic growth that the country got during the last decades. North South MRT Line: The North South Line (abbreviated NSL) was the first line of the metro system in the country. It begins from the Jurong East station in the neighborhood of the same name, and ends at the Marina South Pier MRT Station in the new neighborhood of Straits View. It has 27 stations distributed in a 44 km long network. Eleven of those stations are underground, while the rest are elevated via viaducts. The line is red in the metro’s maps. This fact is especially useful for the millions of tourists that visit the country each year. Going from one end of the line to the other takes around an hour. The trains in this line are comprised of six wagons each. East West MRT Line: The East West line was the second line to be constructed for the metro system, and was inaugurated on November 4th, 1989. The total length of this line’s railway is of 57.2 km, making it the longest route of the MRT. This line is comprised of 35 stations. It begins at Pasir Ris MRT Station in the neighborhood of the same name, and ends at Tuas Link MRT Station in the region of Tuas. This line offers a trip to the Singapore Changi Airport from the Tanah Merah station. The average time that it takes to go from one end of the line to the other is of approximately 78 minutes. This line’s stations are in green color in the metro’s maps. North East MRT Line: The North East Line was the third line to offer transportation to Singaporeans, and was inaugurated on June 20th, 2003. It was the first fully automated line due to its driverless trains. This line’s railway is 20 kilometers long, which begins at HarbourFront Station in the Bukit Merah neighborhood, and ends at Punggol MRT/LRT Station in Punggol. It is comprised of 16 stations. This line’s stations are purple in the metro’s maps. It would take approximately 33 minutes to travel throughout all of this line’s stations. Circle MRT Line: It was inaugurated on May 28th, 2009, and it was the fourth line to be inaugurated. It has the peculiarity of being completely underground. Its railway is 35.5 km long, beginning at the Dhoby Ghaut terminal in the Orchard Road neighborhood, and ending at HarbourFront MRT Station in Bukit Merah. It is divided into 30 stations. Just like the North East MRT Line, it is also a fully automated line. This line is one of the longest driverless lines in the world. This line has an average-sized capacity since, while most trains have six wagons, this line’s trains have three wagons each. It takes approximately one hour to travel from one end of this line to the other. This line is orange in the metro’s maps. Downtown MRT Line: The Downtown Line (abbreviated DTL) is the most recently built line in the system, and it is still under construction. Its railway is 20.9 km long, and is comprised of 18 stations. This line begins at the Bukit Panjang Terminal in the Bukit Panjang New Town community, and ends at the Chinatown MRT Station in Outram. Just like the Circle MRT Line, this line is entirely underground. The DTL line is blue in the metro’s maps. Once this line is fully finished, its railway will be 44 kilometers long and will have 36 stations. This line will offer transportation to over half a million people daily. The total travel time to travel to one end of the fully finished line to the other will be of 70 minutes. All of the Singapore Metro’s lines operate from 5:50 am to 1:00 am. During special celebrations such as New Year’s Eve, the Chinese New Year, the Diwali, the Eid al-Fitr, Christmas, among others, service will be offered for 24 hours. Many social organizations have influence over the schedule of the MRT, with the purpose of offering transportation to every ethnic group during their celebrations. In other words, maintenance and engineering works cannot be done to the metro during days where the metro needs to operate for 24 hours straight, such as days of celebration. North South MRT Line: This line begins at the Jurong East Station, where transfers are available to the East West Line. Also, at the Choa Chu Kang MRT/LRT Station, passengers can transfer to the Bukit Panjang LRT Line service, which is a monorail that has an 8 km long railway. Meanwhile, at Woodlands Station, passengers will find the Woodlands Temporary Bus Interchange bus terminal, in which buses that travel to all parts of the city are available. Finally, at Bishan Station, transfers are available to Circle Line. East West MRT Line: This line begins at Pasir Ris Station. At Tanah Merah MRT Station, passengers can make a transfer to Changi Airport MRT Station to reach the airport. They could also make a transfer to the Downtown Line route. Then, at the Paya Lebar terminal, passengers can make a connection to the Circle Line route. Meanwhile, there is another transfer available for the Downtown Line at Bugis MRT Station. In the following station, City Hall MRT Station, passengers can make a connection to North South Line and Circle Line. Then, at Outram Park Station, transfers are available to the North East Line. Finally, at Buona Vista and Jurong East stations, there are connections available to Circle Line and North South Line respectively. North East MRT Line: This line begins at HarbourFront Station, where there is a transfer available to Circle Line. Then, at Outram Park MRT Station, there is a transfer available to the East West Line. From the East West Line, at Chinatown MRT Station, there is a transfer available to Downtown Line. Two stations after the Chinatown MRT Station, you will find Dhoby Ghaut Station. In this station, which belongs to the North East Line, transfers are available to the North South Line and Circle Line. Meanwhile, in the terminals of Sengkang and Punggol, connections are available to the Sengkang LRT Line. This line is a light railway service that is elevated and has a 10.7 km long railway. Circle MRT Line: This line begins at Dhoby Ghaut Station. This station offers connections to the North South Line and the North East Line. In the stations of Promenade, MacPherson, Botanic Gardens and Bayfront MRT, there are transfers available to Downtown Line. Meanwhile, in the stations of Esplanade MRT, Paya Lebar and Buona Vista, there are connections available to the East West Line. In the Bishan terminal, passengers can transfer to the North South Line and to the Marina Bay Station. Finally, at the North East Line, there are connections available to the Serangoon and HarbourFront stations. Downtown MRT Line: In the terminal station of Bukit Panjang, there are connections available to the monorail of the same name, the Bukit Panjang LRT Line. In the following station, the Botanic Gardens MRT Station, offers transfers to the Circle Line and to the stations of Promenade and Bayfront. At Newton MRT Station, there are connections available to the North South Line. Meanwhile, at North East MRT Line, there are transfers available to the stations of Little India and Chinatown. Finally, Bugis MRT Station offers transfers to the East West Line. Standard Ticket: They can be acquired in ticket vending machines, which are available in all of the Singapore Metro stations. Once you indicate to the vending machine the station you want to go, it will show you the price of the ticket. Additionally, an additional cost of 0.10 Singaporean Dollars (SGD) (0.07 USD) will be charged. The same ticket can be used for up to six times in a period of 30 days since its purchase. Also, the 0.10 Singaporean Dollars that you paid will be reimbursed to you on the third trip done within this period of time. For example, if your trip’s fare is 1 SGD (0.73 USD), by the third trip, you will get a 0.10 SGD refund. Likewise, you will be refunded an additional amount of 0.10 SGD on your sixth trip. These refunds have the purpose of encouraging people to use the same ticket multiple times. Adult Monthly Travel Card (AMTC): It costs 120 SGD (87.78 USD) monthly. With this card, adult customers have unlimited rides for 30 days in the trains and buses. When you purchase it for the first time, it will cost 128 SGD, where 120 SGD is the regular price, 5 SGD is the cost of the card, and the remaining 3 SGD is the minimum deposit required on the card. All of the cards offered to students have a minimum price of 0.37 SGD, and a maximum price of 0.58 SGD. They are divided into the following categories: Student SmartCard, Diploma Student Card, and Undergraduate Card. Student SmartCard: This card is offered to full time students in Singapore, but not for all students. Currently, they are only offered to students under 13 years old enrolled in private institutes, and to students under 21 years of age enrolled in technical schools that do not receive any financial support and that have high grades. Diploma Student Card: This card is offered to full time graduate students that are enrolled in public or subsidized schools. They offer rides in trains and buses. Undergraduate Card: This card is offered to undergraduate students enrolled in public or subsidized universities. Workfare Transport Card: This card is available for people under 60 years old that receive social security benefits or that are registered in a financial support program. It offers a 15% discount in rides. Child Card: This card is similar to the Adult Monthly Travel Card, and has the same price. However, this card offers the additional benefit of allowing adults to bring their children under 7 years old for free to the metro. Senior Citizen Card: This card is available to either Singaporeans or resident aliens that are over 60 years old. It can be used in either trains or buses. Its prices range from 0.54 SGD to 0.87 SGD. Persons with Disabilities Card: With this card, people with disabilities can obtain the Monthly Concession Passes (MCP.) These passes, which cost 60 SGD (43.89 USD) per month, offer unlimited rides on the trains and buses in the city. Food consumption is not allowed in the trains. If you disobey this rule, you will be issued a penalty notice and will have to pay a fine of up to 500 SGD. Drinking beverages, including water, is not allowed in the trains. The reason for this is that the drinks could be spilled on the seats, or create puddles on the floor, or could even be spilled on other passengers. In case that you need to breastfeed your baby, you will need to speak with the metro staff beforehand. Access to the metro’s facilities while under the influence of alcohol or of narcotics is strictly prohibited. Carrying illegal substances on the metro is prohibited. If you try to force open the doors of the train while the train is in movement, you will be fined. Under no circumstance you will be allowed to stop other passengers from entering in any train. If you assault other passengers, either physically or verbally, you will be fined or even be sentenced to prison. Taking pictures or videos in the metro’s facilities is allowed, as long as they are not used for commercial purposes. The only type of bikes allowed in the trains are folding bikes. Regular bikes can be parked in bike racks, which are located in some stations. Smoking is not allowed in neither the stations nor the trains. Bubblegum is illegal in Singapore, therefore, refrain from consuming it in the metro’s facilities. You cannot carry pets nor any other kind of animals on the metro. Therefore, do not bring you pets with you or use another form of transportation. The student passes fares for the metro are different than those for buses. Therefore, check the prices for bus service student passes beforehand. The ticket vending machines use state-of-the-art technology, which allows them to accept Samsung Pay and Apple Pay to pay for the tickets. It is relatively easy to travel to Singapore International Airport by using the metro, since trains can go directly to the airport. To go to the airport, passengers should first board a train from the East West MRT Line, and travel towards the east. They should pay attention and disembark the train at Tanah Merah MRT Station. Then, they should make a transfer to another train, and then head towards the Changi Airport MRT Station. This last station is within the airport. Likewise, if you arrive to the country via plane and plan to go downtown via the metro, you will first need to go to the metro station within the airport. You will need to purchase a ticket in a vending machine by indicating your destination and paying the fare. Then, board a train from the East West MRT Line, and make a transfer to go to downtown Singapore. In the Marina Bay Station, which belongs to the North South MRT Line and the Circle Line, tourists can reach the iconic buildings of Singapore Supertree Grove. These buildings are one of the most striking works of engineering of the city. They are located within the Gardens by the Bay park. The Singapore Supertree Grove consists of huge metal structures that look like trees. There are plants that grow on the trunk of the metal trees. Tourists can go to the top of these trees to get beautiful panoramic views. Also, at night, there are shows in this park. Many tourists enjoy these shows due to their music and lights displays. Meanwhile, Promenade Station, which belongs to the Circle Line and the Downtown Line, is close to the famous Singapore Flyer Ferris Wheel. It is the tallest Ferris Wheel in the world, with a height of 165 meters. At the top of this wheel, tourists can get impressive panoramic views. Each cupula has the size of a bus, and they can be rented for 1,000 Singaporean Dollars (731.90 USD) during weekdays. During the evening and weekends, a cupula ride increases to 1,500 Singaporean Dollars (1,097.85 USD). A ride in this Ferris Wheel is a unique experience.